Steven (Chicagoland, United States) on 6 March 2019 in Plant & Nature and Portfolio. Ça c'est de la feuille ! Magnifique ! Toutes ces grandes feuilles sont très belles. I like these garden centres where you can observe all kinds of plants. Superb. Wonderful green in this hall. A leave for a macro likes me. A great look at this plant Steven. Magnificent color and detail. Nature is truly magnificent. There is a natural umbrella right there. I can imagine the taro being dug up after the leaves become yellow and fade away !! Beautiful composition and green nuances . Huge and clearly visually appealing. A beautiful image of those huge leaves. This is a great conservatory. This huge plant must be happy growing there. Lovely. WOW you found some impressive leaves. A fine shot. These are such pretty leaves and so big! They are quite amazing! 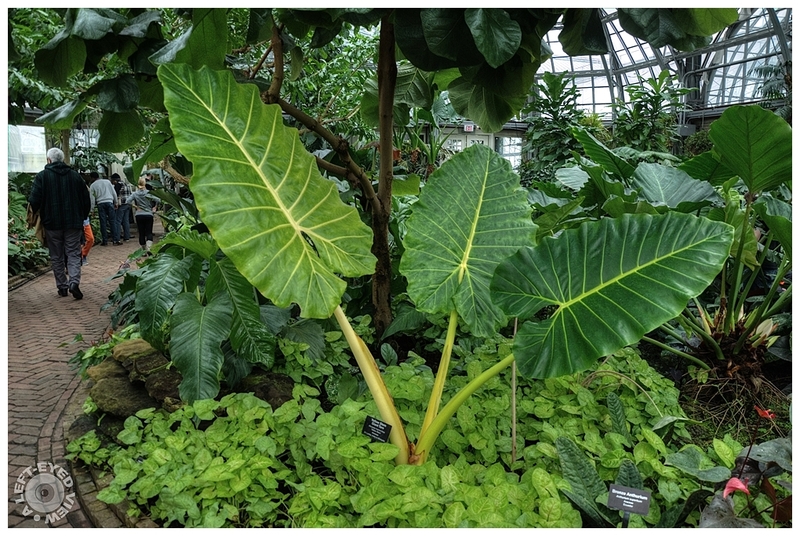 I love those huge leaves!!! Great shot! I have seen this giant leaves in nature, in myanmar, really imposant. great composition here. I saw many of them in Africa, and taro is good to eat, too ! beautiful green house ! Garfield Park Conservatory? I have actually heard of this green house before! Oh yes, I remember now, it was from Chihully's exhibition in London. Impressionnantes, géantes, idéal quand on s'en sert de parapluie ou parasol.